Home Beauty Skin Care Do you believe in these pimples an acne myths too? Acne (or a pimple) is nothing but a menace. A curse that can ruin you both cosmetically and mentally. Ok, perhaps I am getting just a bit too emotional. Nevertheless, it’s sad but true. Acne is a very common skin problem all around the globe. 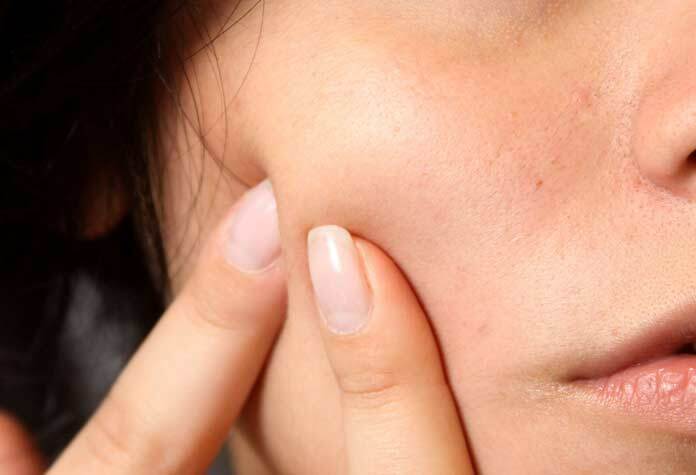 As a matter of fact, acne is the most common skin problem, and almost 80% of the population between 11 to 30 has suffered from acne problem at least once at some point of time. Now that we’re talking about facts, since acne is such a common problem, common as well are the acne facts and acne myths. All of us have grown up hearing a colossal number of facts, tips and do’s and don’ts from our mothers, friends, friendly neighboring aunt, or just anyone for that matter. Not all of those facts are really facts. In truth, most of them are just myths spreading like a wild fire, incinerating the confidence of young and naïve teenagers, making them believe that their life is over as soon as a pimple has erupted over their otherwise flawless skin. Nopes! Nothing is lost. Acne is not the end of the world. It doesn’t even matter. I had acne when I was a teenager, but I can tell you for a fact that it just doesn’t matter. You need to get these acne myths out of your head as fast as you can get. It’s the commonest myth among all acne myths that it occurs only in teenagers. Absolutely rubbish! It’s correct that acne linked to pubertal maturity. It is also true that it is more severe and common among the teenagers. However, adults can never contract acne, that’s certainly false. There is a difference between the severity, occurrence, and appearance of acne in adults as compared to teenagers. Nevertheless, even adults can get acne, even in their 50s. Well, this is something you may have heard all your teenage life (or, hearing it right now). However, not a single study so far has been able to establish a clear relation between acne and chocolates. Thus, it is safe to say that you can have all the chocolates and food you want, you won’t worsen your acne. Still, I would recommend keeping a fair distance from them as they would still do all that damage that they are known to do including weight gain. And, beware, before you get any wrong ideas, read on the next point. Now, you must be wondering how uncool I am. How I tricked you into believing that what you eat doesn’t affect acne, only to tell you later that it does. It’s true cocoa, or caffeine has got nothing to do with acne, but there still are other things in what we eat that can affect acne. Newer studies have found that there is some connection between food and acne. Any food with higher calories raises cortisol levels in blood and that can worsen acne. Higher insulin levels after a hefty meal are likely to increase sebum production leading to clogged pores and acne. Also, another study claims that milk and dairy products could worsen acne too. However, I wouldn’t want the women, especially in her middle age to worry about this. More than worrying about their skin, they need to have their bones strong and healthy. And, for that milk is essential. There is no conclusive research that can link caffeine to acne. As we already discussed in a previous point, coffee, tea, and soda drinks may have an effect on acne because of high sugar levels, hormonal imbalance or bacterial contamination, caffeine directly has no significant effect. It would be a dream come true if you could completely stop acne from ruining your face, by something as simple as washing your face. Sadly, that’s not true. Keeping your face clean is good, but over washing doesn’t help at all. In fact, too much water and soap are going to wash off the natural oil on your skin and leave it drier. Your skin would try to compensate for this by excreting more oil. And, guess what would that do? It will clog the pores and proliferate acne. You should only wash enough to keep the dirt off your face. Do not over wash. If you have an acne breakout you can wash your face with a mild cleanser at night and apply a cream containing retinol. Well, whenever you’re in a crunch situation and a pimple pop outs of your otherwise flawless skin, that can’t be an ill-fated coincidence, can it? Although the data to confirm the relation between stress and acne isn’t as sufficient as we’d want it to be, the fact cannot be denied that stress often is related to acne. Stress causes hormonal imbalance in our body, and it is this hormonal imbalance that can be a culprit behind acne breakout. A Research by Wake Forest University School of Medicine established that teenagers who are stressed have 23% higher risk of having a severe acne attack. Apart from hormonal imbalance, stress-induced inflammation may also have a role in acne breakout and affects everyone irrespective of gender and age. Thus, it is recommended to take benefit of stress relieving relaxation activities like yoga to keep acne at bay. To some extent, it’s true that sunscreen can clog the pores and worsen acne. However, since not all kinds of sunscreen need to be banished when you have acne, this sentence is largely a myth. You should choose a sunscreen that doesn’t block the skin pores. Switch to physical sunscreen (containing zinc oxide or titanium dioxide) that reflects UV rays, instead of a chemical sunscreen (containing avobenzone or oxybenzone) that absorbs UV Rays. Zinc oxide is also beneficial in killing the acne causing bacteria. No, moisturizer doesn’t play a part in proliferating acne. In fact, moisturizer can help in fighting it. Use a light moisturizer to keep your skin hydrated. It will prevent your skin from secreting excess oil to take care of dehydration. Lesser oil secretion means lesser chances of acne. It’s true that some makeup can clog the pores and, thus, proliferate acne. Thick liquid foundations or pancake makeup are particularly bad for acne. However, a loose powdery foundation like mineral powder foundation containing zinc oxide, silica or titanium dioxide are helpful in acne. They absorb excess oil, thereby preventing clogging of skin pores. Although you may be tempted to use liquid foundation to hide pimples, it’s better to avoid them or use non-comedogenic products. Most people suffering from acne rely on various creams or cleanser that they can straight away go and buy over the counter without a prescription. Although there’s a chance they’d treat the acne, sometimes they won’t. It’s advisable to spend some money in getting a prescription where a dermatologist would choose the best product for you based on your skin type, problem cause, and severity. Benzoyl Peroxide and Salicylic acid aren’t the only medical treatment option for acne. Certainly not true. You may be tempted to buy 10% benzoyl peroxide instead of 2.5%, however, studies have proven that all concentrations have the same effect. Unfortunately, a higher concentration is only going to irritate the skin more. It’s true that toothpaste can dry out acne, however, do they make things better? Toothpaste is made for teeth, and not face. They’ll dry out your skin, and can cause itching and rashes. What’s the use of replacing one problem with other, when you can properly treat acne with proper remedies? We shouldn’t pay much mind to acne. But, it’s not always the case. Particularly in teenagers, acne is not just a cosmetic issue, but also a trouble to their mental health distressing their mind and composure. Youngsters may even get depressed, greatly impacting their quality of life. Furthermore, if acne isn’t treated well, it might even lead to a scarring that would last forever. Some people even believe that tanning actually helps in reducing acne. The fact is it doesn’t. It’s just another of those acne myths. All tanning does is hide the redness of the acne behind the tan. On the contrary, excessive or frequent tanning would flare up an episode of acne, because it steals the moisture from the skin. When the skin gets dry, skin pores secrete more oil, thus proliferating acne. It’s a common belief that there exists no real medical treatment for acne. It’s also commonly believed that acne would go away by itself even when treated alone. False and false. There do exist medical treatment options for acne. If you have acne you can consult a dermatologist for best treatment options, instead of believing in useless acne myths. A lot of people pop their pimples, pick at them thinking it will make them go away. Myth! Popping pimples is only going to make the situation worse. A popped-out pimple will leave a scar for life. Furthermore, the pimple will come back anyway. If you’re really desperate to get rid of them, ask your dermatologist to give you a prescribed injection. There’s no truth to it. In fact, blocked pores, i.e. blackhead (open comedones) have nothing to do with dirt. It’s the excessive oil secrete, dead skin and protein that constitutes the clogging material in your pores. You must use retinoids (Vitamin A derivatives) to treat blackhead as they increase cell turnover thus treating blackheads. Chlorine can help in drying out pimples. However, it doesn’t come without side-effects. Excessive chlorine can dehydrate your skin, cause itching and rashes. Same scenario as with toothpaste. So, you can go swimming to get rid of acne, however, don’t forget to use an oil-free lotion afterwards to prevent dryness. The pathogenesis of both acne may be similar, but the way skin absorbs the topical products their treatment methods should be different. Since hair follicles on other body parts are far from each other as compared to facial hair, the absorption is also low. The remedies that may work well for face, may not work as good on your back. Thus, it’s recommended to see a dermatologist for your problem. Further Reading: Open Pores: What Are Open Pores, What Causes Them And How To Get Rid Of Them? Previous articleOpen Pores: What are open pores, what causes them and how to get rid of them with traditional treatment and home remedies for open pores?